Writing baby shower cards is a happy event. Nevertheless it can turn into a pain if you cannot think of anything adequate to write. These shower card messages give you lots of helpful phrases to find the best wording for your card to the soon-to-be mother / parents and baby. A meaningful congratulations card for the new family complementing your baby shower gift will make your giving just perfect! Usually, the shower card is addressed to the mother of the baby. Write 'Dear (Mother's First Name)' inside the card if you are close to the expectant mother. If the baby shower is formal write the mother's proper name, also if you only know the expectant mother in a professional setting. Write both parents' names if it is a couples shower or if you are good friends with the father as well. Also, the name you write inside the card should be the same as on the outer envelope of your card. * A precious little girl / boy is on the way! A very warm welcome and may your days be filled with happiness and fun. * Congratulations and best wishes! A shower gift for your baby, I am / we are so glad to have a reason to shop for you and your new baby! All the best! * My / our congratulations and best wishes to you as you step into this exciting new phase of your life. Be ready for busy days, sleepless nights, many questions and endless love! * A little gift, wrapped up and tied, with our very best wishes for the baby inside. * Congratulations and best wishes. Your life will never be the same, but you will love the change. * If you are worried about not having enough space when the baby comes, get rid of your bed. You won't be using it for a while anyway. Congratulations! * Most great things start out very small. And then become extremely overwhelming as they grow... Congratulations on your new bundle of joy! 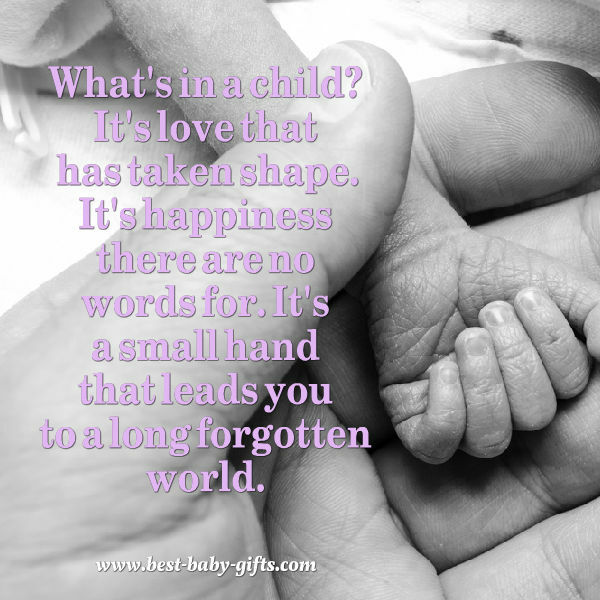 * A precious new baby has come from above, to live in your hearts and fill them with love. Congratulations on your baby girl / baby boy! * Congratulations on the upcoming birth of your baby. Best wishes for a lifetime of happiness and joy! *What's in a child? It's love that has taken shape. It's happiness there are no words for. It's a small hand that leads you back to a long forgotten world. Congrats, we are so happy for you. Enjoy your journey into parenthood and have fun! We are wishing the best for you three in the coming months. * Congratulations! This little miracle will soon make your world more beautiful and happier. * Many best wishes for the remainder of your pregnancy and the birth of your little bundle of joy. * I / we can't wait to see the new baby! 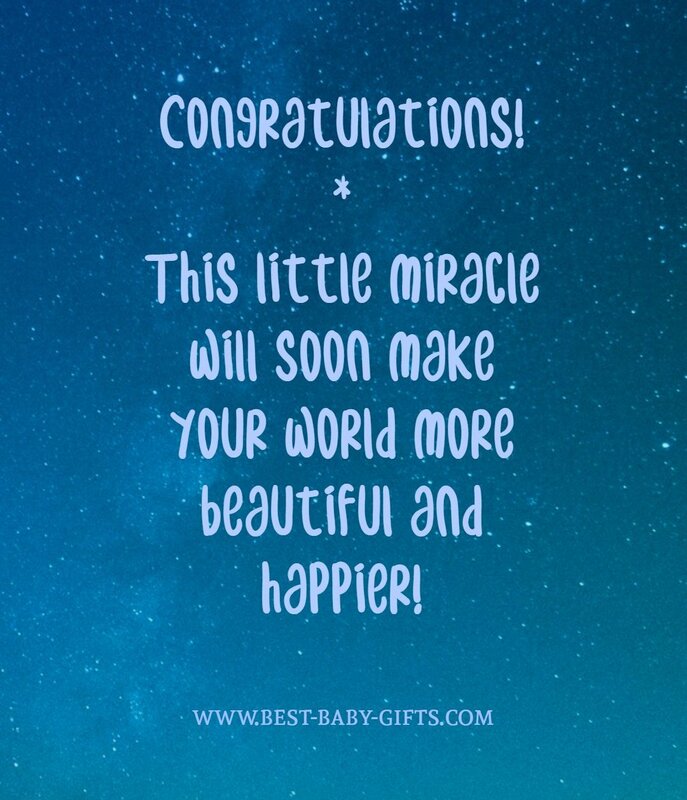 Congratulations and wishing you all the best, you are so blessed with this little one! * Whether a girl or a boy, there's no greater joy than the news of your being with child. Happy pregnancy and all the best. * Baby is almost here, wishing you a safe delivery. Congratulations, may he/she bring you many happy memories. * Congratulations on your upcoming arrival and good luck with your pregnancy. * Here's our 3 months forecast (number of months / weeks depending on when the shower takes place): a 'shower' followed by a very sunny baby! * Congratulations! What an exciting time for you! I am / we are so happy for you and wish you all the best for the rest of your pregnancy and the birth. * Here's to smiles, health, happiness, laughter, patience and joy. We hope you get a healthy baby girl or boy. May your new little bundle of joy bring you many blessings in the future! *Congratulations! Your home will soon be filled with toys and will never be quiet again. Your house will often be a mess and you'll frequently be tired. But there will always be love and laughter! All the best and many happy memories. * Congratulations, you have new life coming! May you and your baby grow together in joy and happiness! * There will be hands carrying you, arms in which you will be safe and people who will show you that you are welcome! * Can't wait to meet those tiny little feet! * A new baby to love! It's beautiful to think, how a life so small, will fill your world with a love so great! May your future be filled with new experiences, joy, much love and happiness. If you want to keep it simple: *Congratulations - mum to be! * A new baby is on the way? Another great excuse to shop! Congratulations and all the best! * Congratulations on the new baby! I am so happy and excited for you. I know you will be an excellent mother (excellent parents) and I can't wait to meet your baby. I look forward to helping you along the path of motherhood (parenthood) and watching the little one grow from a baby and blossom into a young girl/boy. * Wishing you a happy and healthy pregnancy and a safe delivery of your little pea. I am so happy for you and (name of husband / future dad) and wish you all the best as you wait for baby's big debut! I know that you two are going to make awesome parents. * I would lend you my heart, my strength, my patience and my confidence for the birth of your baby - but I know that you'll need none of that since you already possess all of this within yourself! In the coming weeks I will be thinking a lot of you. Becoming and being a mother is the biggest change in life. I have never thought that I could feel such a deep love for my baby. And I am so pleased that the most wonderful time of your life will soon begin. Nothing compares to the feeling when you will finally hold your baby in your arms! For religious and Christian baby shower sample messages as well as baby bible verses please follow this link. There you'll also find ideas what to write in a baby baptism or baby Christening card. simply skip a line and sign your name. When baby has already arrived: what to write in baby congratulations cards. All kind of inspirational and funny baby sayings to add to your baby shower card. 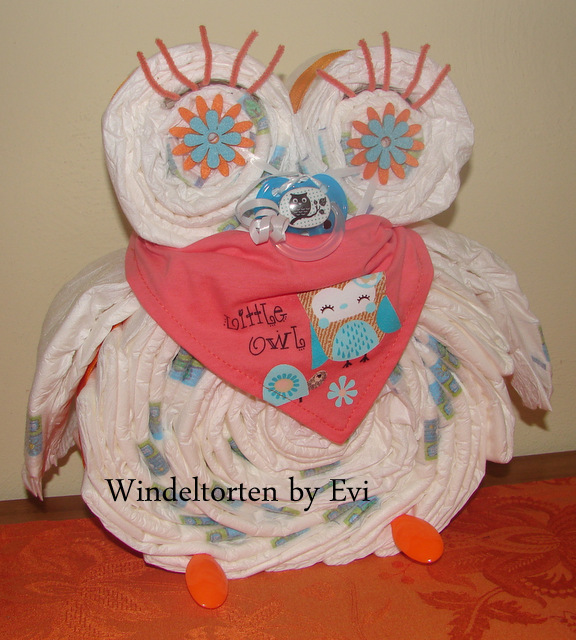 Homemade diaper owl - so cute! Get your diaper owl tutorial here.